Flickr / andreasYes way rosé. It’s that time of year when nothing sounds more refreshing than a glass of rosé. But it can be hard to know what you’re getting when you order a rosé, because unlike red or white wine, rosés are often lumped together as one large group. Turns out there are three different types of rosé, and type has a lot to do with quality. We chatted with Mary McAuley, the founder of Ripe Life Wines, to get the lowdown on the three different kinds and what they each mean. As the name suggests, a blended rosé is made from blending bulk market red and white wines. The thing to keep in mind is that these red and white juices are being combined because they didn’t have the quality to stand alone. McAuley describes the red and white remnants as “bitter, jammy, sugary, unbalanced, or at best just bland and unimpressive.” These flaws often result in producers adding sugars, acids, or artificial flavoring to the rosé to make it taste better. This type of rosé is the most common. It’s made by “bleeding the tanks” of red wine. When making red wine, sometimes the producer will drain juice from the tank, so that there’s more grape skin than juice left in it. This is because the grape skin is what provides wine with most of its structure, colour, and tannin. The juice that’s been drained is referred to as “runoff,” and it’s pink. So the quality of a saignée rosé depends on the quality of the red wine it’s made from. 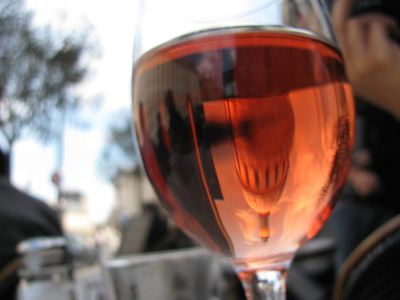 Designate rosés are the hardest to find since they’re produced from red grapes that are used solely to make rosé. McAuley compares this type of rosé to farm-to-table dining. The grapes are farmed, harvested, crushed, and fermented purely with the intention of being made into rosé. Designate rosés are less common because red wine generally costs more than rosé, which means that producers make more of a profit when they use red grapes to make red wine.